I’m not much into fashion, but one of my guilty pleasures is reading Tom and Lorenzo’s run-downs of the dresses and suits worn to award shows like the Grammys and the Oscars. I’ve been thinking how their comments do (or don’t) apply to non-celebrities and how those comments might be used as guidelines for creating a flattering, uncluttered wardrobe. Tom and Lorenzo were full of praise for David Oyelowo’s red tuxedo at the 2015 Oscars, noting that the color looked great on him. If you read through their write-ups from a number of awards shows, you’ll see plenty of comments about something being a good look (or not such a good look) for that particular person. So feel free to ignore “what every wardrobe needs” advice, which will almost certainly include something that won’t look good on you or doesn’t fit your needs. I cringe every time I see a white blouse listed as an absolute necessity, since white is most definitely not my color. Also, given my current lifestyle, I really have zero need for a white blouse, even if it would look good on me. Don’t worry too much about trends, either. Marsala is the color of the year, but don’t buy something in that color if it doesn’t become you. Instead, fill your closet with clothes that are right for you, specifically — clothes with flattering colors and styles, and clothes that are appropriate for the way you live. If you’re not sure what looks good on you, ask a friend with good clothes sense or splurge on hiring a wardrobe consultant. (You might save money over the long haul by not buying clothes you wind up discarding because you discover, too late, that they’re wrong for you.) You might also consult an expert who focuses just on identifying your best colors; I did that some years ago, and it was extremely helpful. Tom and Lorenzo’s commentary is filled with notes like: “The pants are too long” and “The pants need hemming.” There are also comments about clothes that are too tight or too baggy. These comments are directed equally to men and women. When shopping, be honest with yourself about whether or not something really fits. If you love something and it’s perfect except for a slightly wrong fit, consider whether it could be easily altered. If so, do you have the skills to do that, or are you willing to pay to have it done? That’s a reasonable comment from fashion critics writing about a celebrity. But unless you work in a fashion-conscious industry, you probably don’t need to worry about wearing the same outfit (or outfit components) fairly frequently. Either no one will notice, or no one will care. However, the more memorable the outfit, the less frequently you may want to wear it, as people will recall something like a jacket with a wild, brightly colored print. If you have the money and space for an extensive wardrobe, and clothes are your passion, you may want to own enough of them that repeated outfits are infrequent. But those who prefer a more streamlined wardrobe can often go that route without concern. Some people even choose to own multiples of basic wardrobe items so they can wear identical outfits every day. That choice might well be noticed — think of Steve Jobs and his 501 jeans, black mock turtleneck and New Balance sneakers — but needn’t be a problem in the right environment. And sometimes even a large degree uniformity isn’t noticed, or at least not remarked upon. A male TV presenter wore the same blue suit (but with different ties and shirts) almost every day for a year, and neither he nor the station got any comments about that. All Unitasker Wednesday posts are for entertainment — we don’t want you to buy these items, we want you to laugh at their ridiculousness. Enjoy! A couple weeks ago, I randomly started thinking about that knife and how strange it was. It reminded me of a movie or play prop, not something you would actually use in a kitchen. I researched what a couple of the most trusted food scientists today had to say on the matter of traditional knives causing lettuce to brown to see if they were true. If the leaves need to be divided into smaller pieces, this should be done with the least possible physical pressure, which can crush cells and initiate the development of off-flavors and darkened patches. Cutting with a sharp knife is generally the most effective method; tearing by hand requires squeezing, which may damage tender leaves. Though all lettuce began showing some browning on the ribs after 10 days, none showed any signs of browning on the cut or torn surfaces. After 12 days, the heads cut with metal knives showed faint signs of browning on these surfaces, and the lettuce cut with the plastic knife followed a day later. The torn lettuce was last to brown on its ruptured edges, starting to turn at 2 weeks. In short, the test kitchen discovered that lettuce naturally browns by 10 days, making the methods for cutting or tearing pointless since the cut/torn edges didn’t brown until a couple days later. As I said, it’s hardly an endorsement to buy a special knife. My guess is that most people don’t keep lettuces in their refrigerators for more than 10 days, especially since they can’t be frozen. People buy lettuce and use it in a week. 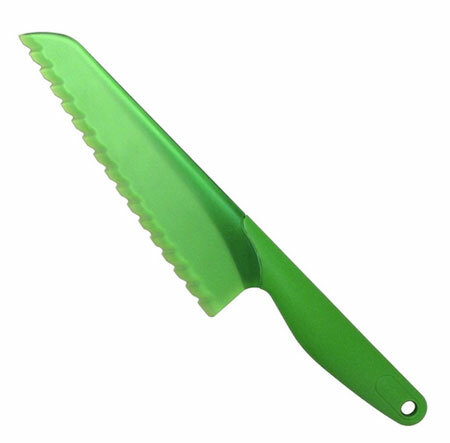 If you are someone who does keep lettuce for more than 10 days, the lettuce will already be brown, so using a plastic lettuce knife won’t matter. For best results when cutting lettuce, use a very sharp, very thin, stainless steel blade and then plan to consume the lettuce immediately or up to 10 days after purchase. If you plan to cut it and store it, be sure to buy the freshest lettuce you can so as to make it those full 10 days (if the lettuce is old, it won’t even last 10 days before browning). You can also tear lettuce with your hands if you plan to use it right away, not dirtying any knives at all. Knowing how to use and care for the knives you already own will save you from spending money on specialty tools you don’t need, especially when the specialty tools don’t improve or benefit your desired outcome. Feeling stressed? Here are seven way to better handle the anxiety. 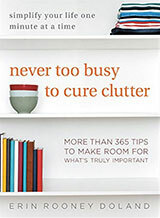 The March 2010 issue of O: The Oprah Magazine just hit newsstands and it is dedicated to the theme “De-Clutter Your Life!” The uncluttering articles begin on page 142, but most of the content in the rest of the magazine is tangentially related to the topic. The website Design Public is hosting an Organization Blog Fest for a week, and they asked me to be a part of the advice-wielding group for the second year in a row. If you’re not lucky enough to have a designated drawer for food storage wraps in your kitchen, you probably have to sacrifice space in your pantry or cupboards for these items. Yesterday, Jacki Hollywood Brown’s article explored the relationship between music and productivity. Today, I want to continue with another productivity booster, which has been called the “third pillar of health,” sleep. The relationship between sleep and productivity seems obvious: adequate sleep means you’ll have enough energy and focus for the coming day. While that’s true, there is much more to it than that. A 1999 study discussed at 2013’s Corporate Sleep Health Summit demonstrates that a lack of sleep can affect not only productivity, but innovation. After losing just one night’s sleep, subjects experienced “…particular impairment to tasks requiring flexible thinking and the updating of plans in the light of new information.” While most people don’t regularly lose an entire night’s sleep, consider that many driven business people and entrepreneurs wear their four and five hours of sleep like a badge of honor. Meanwhile, a BBC study suggests that deep sleep “makes room” in your brain for the next day. “One of the main things the brain is doing [during deep sleep] is moving memories from short-term storage into long-term storage,” the study claims, “allowing us more short-term memory space for the next day. If you don’t get adequate deep sleep then these memories will be lost.” Ever forget some crucial information for that big meeting? An extra hour of sleep could be the remedy. Now that I’ve described just some of the benefits of a restful night’s sleep, I want to point out some technology that will help you hit the hay. Sleepy Fan ($1.99, iPhone). When I was a kid, I spent summer nights falling asleep to the sound of a large box fan, not unlike this one. 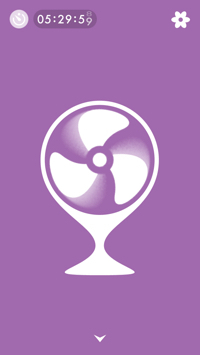 I fell in love with is steady hum, and today I use the Sleepy Fan app in its place. It offers three fan types to choose from, and even lets you adjust the sound itself. The FitBit has a feature that lets you track your sleep. When paired with a smartphone app, it lets you view data on your previous night’s rest, including restful moments and when you were fidgeting. The Philips Wake-up Light is a nice alternative for those who dislike being jarred awake by a screeching alarm. Over a period of 30 minutes, the Wake-up Light gradually brightens itself from dark to a custom illumination level (up to 250 lux) and provides pleasant audio. You can get a good night’s sleep, listen to music appropriate to your task at hand, and enjoy a satisfyingly productive day. There have been many studies over the years about the effect of music on productivity in industry. One study has suggested that music increases productivity when workers are engaged in repetitive tasks that may not be intellectually stimulating. The findings of another study show that music has a positive effect on a person’s emotional state and can help with self-motivation. Dr. Lesiuk of the Frost School of Music at the University of Miami carried out a study in which workers could listen to whatever music they liked for as long as they wanted. She found that those people who were reasonably skilled at their jobs realized the most benefit. Workers who were identified as experts saw almost no effect on their productivity and some novices found that listening to music was distracting and did not help them accomplish the tasks (which makes sense as they were acquiring new skills). In short, music will likely help you and/or your employees be organized and productive. If you have a project you have been putting off for some time or if your task involves repetitive work (such as sorting through clothing), turn up the volume and listen to your favourite music to get you motivated. However, if your task involves complex decision-making (such as writing a research proposal), you may want to keep your surroundings quiet, especially if the task is something you don’t usually do. Personally, I find when I listen to dance music with a fast beat (anything from the Big Band Era to Disco to Electronica) my house gets organized and cleaned much faster. When I have a large re-organizing job such as a storage area clean out, I listen to classic rock (Led Zeppelin, Rush, Van Halen, AC/DC). If I’m working on a project that requires my full concentration such as writing or working on data analysis, I don’t listen to music at all because I end up singing to the music and getting distracted from my work. Most of the time I work from home so I can choose the music I like, but if you share a working space, keep a set of comfortable headphones handy so as not to disturb your co-workers. At the office, always check with your manager or supervisor before you don your headphones. Some companies have policies regarding listening to music during working hours. If you are a manager, consider letting employees listen to music if you find it makes them more productive. Do you find listening to music helps you be more or less productive? Share your thoughts in the comments below. Get ready to spring clean your home with a basic plan. If you’re good at procrastinating and do it often, putting off doing your 2011 tax returns would be a very simple thing to do. I know it’s even easier to procrastinate doing them when you suspect you owe the government money. There’s no need to let stress about completing your taxes take its toll on you, though. Getting started with just a few easy tasks right now can alleviate some of your anxiety, help you to be better organized, and assist you with meeting the federal and your state’s tax deadlines. Save limited desktop space by using a vertical laptop stand. I’ve been part of the Unclutterer writing team for a few years now. In that time, I’ve come to realize that with every post in some ways I’m “preaching to the choir.” That is to say, my posts are read in part by people who already have adopted a clutter-free mindset. That’s awesome for those people, and I’m so happy they come to the site to learn even more ways to live simply. However, I realize there are also members of the readership who are still working on uncluttering and simplifying. Which, admittedly, part of me is, too. For the collection of us who haven’t yet achieved full “uncluttered enlightenment,” this post is for you. As you can see in the video above, each Where’s Wallet (they produce three models) contains a sensor that connects to an iPhone app. All you need to do is download the app and let it “discover” the wallet. Next, you tell the app to send you a message if you stray farther than you prefer from your wallet. (You set the distance.) There’s an option that lets you set how far away you’re allowed to get before the alarm goes off. I love it. I also assume if you have misplaced your wallet in your home, you could reset the length of the tether to a small distance and then walk around until the app stops beeping. At that point you would know you were within close proximity to the wallet’s location, although there would still be a little searching. This wouldn’t be as convenient as a Tile Tag for this specific purpose, but it would certainly get the job done as long as you were in the same house as your wallet. Years ago, my wife would tell people, “Dave’s hobbies include board games, music, and losing his wallet.” I was very good at it. A product like this would have saved me some frustration and prevented my wife from making this humbling –- but entirely accurate –- joke at my expense. As of this writing, Where’s Wallet is has about $10,000 to go in its campaign with 33 days left. If this is something that you (or your spouse) can use, consider becoming a backer. Have you thought about exactly what kind of thing you’re collecting? For example, a stamp collector might want to focus on first day covers or, alternatively, may have no interest in those covers. You may start out with a wide scope and decide to narrow it over time. What are your priorities for adding to your collection? Do you have some holes in your collection that you want to fill? What’s your budget? Museums have policies for “unsolicited donations,” and you may want a policy about gifts from well-meaning friends who notice your collection. Do you want to discourage them from buying you gifts to add to that collection, or are you happy to receive such gifts? When do items get removed from your collection? Museums sometimes remove items if they are redundant with others in the collection or if they are “of lesser quality than other objects of the same type in the collection.” They may also remove items that are “unduly difficult or impossible to care for or store properly.” Items may also get damaged to a degree where they no longer fit within the scope of the collection, and those items would be removed. These same types of considerations could easily apply to your personal collection. And if the scope of your collection has changed over the years, you may find items that no longer seem to fit. Museums only display part of their collection at any time, rotating the items on display. Therefore, a museum’s policies will need to deal with caring for items currently on display and those in storage for future display. You may need to consider both situations, too. Just as a museum would, you will want to consider whether items in your collection need to be kept at any specific range of temperatures and humidity. Depending on what items you collect, you may need to plan for pest control. You’ll also want to think about how to keep fragile items from being broken when on display and when being stored. Would you ever consider loaning out items in your collection? If so, think about whom you might make a loan to and how you’d want to handle any such transactions. If you have a large collection, not all on display, having an inventory will help you remember what’s being kept where. An inventory will also keep you from buying duplicate items by mistake. At some point, your collection will move on to others. You may choose to sell some items or give them to friends and family members, or others may inherit them from you. If you’re selling an item, the buyer may want evidence of authenticity, so you’d want to have a plan for storing any documents you have that address this. If items are being inherited, the recipients will often enjoy knowing the stories behind the items — when and where you got them, and why are they meaningful to you. If your collection includes items of significant value, you may need specific insurance to cover the collection, which might involve getting appraisals done. That proof of authenticity mentioned previously may also affect the appraisal. In case of a loss (due to theft, fire, flood, etc. ), the inventory list previously mentioned would be extremely helpful when making a claim to your insurance company. In the time before cell phones, people carried this quaint little card around with them in their wallets. It helped to quickly determine the amount to tip someone for their services. It only served one purpose, even then, but it had utility and was convenient. But then came the prevalent flip-style cell phone in the 1990s with its multipurpose calculator program, which made this little Tip Table less necessary. And now, making the Tip Table obsolete, there are hundreds of tip and bill splitting apps for smartphones that provide multiple features and require no space in your wallet. (Android and iPhone) Not to overlook the obvious, either, that service tipping has always been able to be determined by doing math in one’s head, one one’s fingers, or working it out on a slip of paper. Here’s to the Pocket Card Tip Table. You served us well, old friend. Enjoy your retirement! Are you building a custom home? 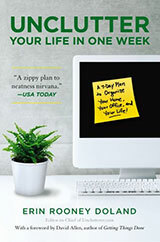 Here are four ways to stay organized. Reader Katie wants to know how to handle tech clutter. She has old wires, chargers, manuals, and cables cluttering up her room. If your linen closet is cluttered and overflowing with bed sheets, it might be time to unclutter and organize your collection. Instead of throwing away plastic grocery bags, reader Robert is looking for ideas on ways to reuse them. In the article “10 ways to let go of your stuff,” I spend 1,000 words talking about my transformation from a clutterer into an unclutterer on pgs. 119-120. Please forgive my relatively high level of excitement for such a bland product, but sometimes it is the smallest things that make life better. When our family first moved to England in 2013, our children were concerned about wearing school uniforms –- something they didn’t have to wear in Canada. After living here for almost two years, we’ve come to love school uniforms for many reasons: they save time, help us stay organized, and save us money. After experiencing the benefits of school uniforms with my kids, I’ve adopted a uniform-style wardrobe for myself. Keeping a few basic pieces (similar styles of slacks, shirts, etc.) and a limited range colour palette, I can mix and match fewer pieces and still have a varied wardrobe. The uniform-style wardrobe is much easier to maintain and organize and is less expensive than my previous numerous-outfit wardrobe. In the mornings, little effort is expended deciding what to wear. The children simply put on their uniforms and I select a pant and top (they fit and they all work with each other). When shopping, we know exactly what to buy for school clothing and I have a specific idea of what I need. The school provides the requirements for the kids and lists a few stores that provide quality clothes that meet the dress code. When doing laundry, I don’t spend nearly as much time as I did in Canada separating clothing out by fabric type and colour. Because both children wear the same uniform, we have one load of white dress shirts and one load of black trousers every week. And, since my wardrobe is in a limited colour palette, I experience similar benefits. We have found that we are spending a lot less on clothing than we did in Canada. The quality of my kids’ school uniforms is very good. They wear like iron and wash like rags so they do not need to be replaced as often as other clothes. This reduction in our overall clothing budget has led to less packed closets that are easier to organize. The uniforms are neatly stored in one area and separated from the (much smaller) selection of non-uniform clothing. Do you or your kids have a uniform-style wardrobe? Share your strategies for easier wardrobe maintenance with other readers in the comment section. Reader April asks how to control her credit card clutter that is overwhelming her. George Washington’s biography is a nice reminder that the problems and aggravations we face currently, and our desire for a more simple life, are often very similar to those experienced by the people who lived before us.